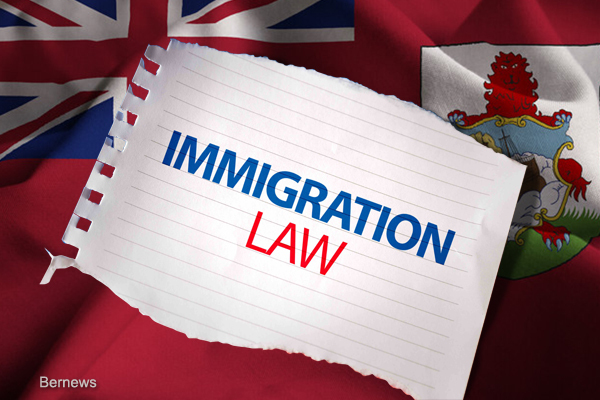 In a post on social media, Minister of National Security Wayne Caines said, “Over the last 3 months I have been working diligently on Comprehensive Immigration Reform. “Comprehensive Immigration Reform has been a work in progress for a number of months. It must be noted that Comprehensive Immigration Reform was also considered by the previous Government. “There have been quite a few reports on Comprehensive Immigration Reform. We are collating the reports and analyzing data and recommendations. “The latest report by Bipartisan Immigration Reform Group was submitted to me on December 11th. We have turned the report into a Cabinet Memorandum that will soon be considered by the Cabinet. “After the Cabinet and respective Parliamentary stakeholders opine and make recommendations, our immigration reform plans will be set out publicly which will include, and not be limited to, key recommendations and implementation steps. “What I must make clear, I know that immigration reform is pivotal to the success of our country. I believe that we must have a balanced approach to immigration reform. “I am aware of all of the nuances and complexities facing many families living in Bermuda. I meet with families everyday. I hear the stories, I hear the pleas. My inboxes [Facebook, email, Instagram] are filled with people sharing their plights and concerns. “Immigration is a a hot-buttoned topic, there are people that have legitimate concerns of how immigration reform will affect the social homeostasis on our island. There are others who want direction and a clear and defined roadmap. In response, Shadow Minister of Home Affairs Sylvan Richards said, “We must provide a route to status for those long term residents who are ‘Bermudian’ in every sense of the word, some who have known no home other than Bermuda, but who do not currently have an avenue to obtain Bermuda status. “This will assist in stemming the tide of residents leaving the Island seeking greener pastures elsewhere thereby further decreasing our resident population. “We must then provide a measured liberalization and streamlining of our immigration policy to encourage job creators currently not operating in Bermuda to consider Bermuda as a domicile of choice. This will facilitate job creation for Bermudians. “In addition, an effective PR campaign should be put in place to broadcast to the world that Bermuda is not only open for business but that we welcome job creators and companies not currently domiciled or present in Bermuda to consider Bermuda as their domicile. “Finally the public consultation should be allowed to occur without the rancor and obstructionist activity that occurred when the prior government attempted to engage the public regarding our attempts to discuss Comprehensive Immigration Reform. The various unions and other groups such as the People’s Campaign must commit to allow this discourse to occur so that all voices can be heard. “Reform is well overdue and if the legislation does come before MPs in July, that will be two years after this Government won the election. While Minister Caines appears to have pushed this issue forward, it is a shame it was so delayed under his predecessor. It must not be delayed further. A whole lot of nothing. Pathways to Status would have led to more jobs and investment in Bermuda than Blockchain or BurtCoin ever will!! Sooooo you are doing what the OBA tried to do. Glad to see you can see clearly now. Implementing OBA policy. Finally some common sense. I hear silence … no sounds of marching … why not? Why, the seniors didn’t agree to operation human shield this time? Putting together some pensioners and children to have at the front. BitCoin Dave and Curtis at least understand what needs to happen. It’s a question of whether or not they can drag along the perpetually offended and the chips they carry around on their shoulders. STRAIGHTFORWORD and crew are going to have an aneurysm when they read this lol. It HAS to happen and Sandgrownan is right, Davey and Dickerson KNOW it. The spin will be the epitome of irony. Frankly though, I don’t care. Spin away for the benefit of the likes of STRAIGHTFORWARD, make them feel great about it. Just get it done, or we are doomed. Hell, do that and I’ll vote PLP. Finally!! People who are here riding/running aimlessly, those who sneak around our beautiful island home, those with wacked-out superiority complexes,those who are here and want BORN BERMUDIANS gone….yup… this is a necessary move. Respice Finem P.L.P., ensuring OUR well-being comes FIRST. TOO MANY FOOLISH, SNEAKY HAPPENINGS HERE IN SMALL BERMUDA. If there are those who disagree, then a shoe fits their feet, quite snugly!! Hahahahahahaha hahahahahahaha hahahahahahaha hahahahahahaha hahahahaha. You really have no idea what this means, do you? I waited all day for this and you didn’t fail me. Nope, he has no idea. lol Apparently there are a bunch of (no doubt) people sneaking around and riding/running aimlessly (those two terms are diametrically opposed btw…if you are sneaking around you don’t do it aimlessly, that is the quickest way to be found/caught). They don’t work or benefit the economy in any way shape or form and are “out to get” the likes of this idiot (and me too I guess, being a BORN BERMUDIAN and all). But now it is “his turn” and all benefits under a PLP government should be directed at him and his buddies. It is idiotic babble that makes no sense at all. But as long as he agrees with Burt and Dickinson for the need for Immigration reform….cool. What is funny is that he and the protestors who carried signs yelling for Comprehensive Immigration Reform under the OBA assumed it actually meant what he alludes to above….getting rid of foreigners. hahaha Morons. Its something that needs to be addressed–so regardless of the histronics and emotions–let’s move this forward and get it done. a plan to promise to make a plan on how to consider making a plan……!!! Just do it already. And. Stop. Talking. Bermudians. talk. everything. to. death. Immigration reform is overdue and it is such an emotive issue. I, however, look forward to an open and respectful discussion. Minister Caines, Thank you for taking the immigration bull by its horns. Thank you for listening. Thank you for caring about people. Thank you for being engaged. Thank you for giving us hope. With many Bermudian May 2018 University Graduates still not able to secure jobs, be careful not to suddenly release Non-Bermudians to the market, the unemployment rate among young Bermudians will sky-rocket.